If there is one thing I completely indulge in with abandon in the summer, it is ice cream. While I appreciate straight up vanilla, I love to try unexpected flavors. Even better, however, is trying to replicate unique flavors at home myself. That’s why instead of going savory with a jar of black sesame seeds I decided to go sweet. Think of black sesame seeds as the more colorful, bolder-flavored sister of the white sesame seeds we already know. And, just like tahini is a paste made from white sesame seeds, you also can turn black sesame seeds into a paste. In many Asian cuisines, black sesame paste is used in both savory and sweet dishes. Popular desserts include mochi, bread, dumplings and you guessed it, ice cream. This ice cream has a wonderful light gray color and a rich nutty, smoky flavor. I garnished my scoops with a simple sprinkle of whole black sesame seeds, but fresh fruit, especially berries, would be delicious too. Toast the sesame seeds in a small dry skillet over medium high heat. Stir constantly, until they begin to pop and become fragrant. Let cool. Once cooled, add the toasted sesame seeds to a food processor. Pulse until they become a gritty paste. Pour in the honey and continue pulsing until smooth. Set aside. In a medium-sized saucepan over medium heat whisk the milk, sugar, sesame paste, and salt until dissolved. In a large bowl, whisk the egg yolks until they become light in color. Temper the eggs by very slowly whisking the heated milk into the eggs. Pour everything back into the saucepan and return to the stove over medium heat. Stir until the mixture reaches between 170 -175 degrees Fahrenheit, when it coats the back of a spoon. Add cold cream to a large mixing bowl. Then slowly pour the heated milk and egg mixture into the cold cream. Add the vanilla and whisk to combine. Add the completely cooled ice cream mixture into an ice cream machine and churn for approximately 25 minutes (refer to manufacturer instructions). Once churned, it will be the consistency of soft serve. Transfer the ice cream to a freezer-safe container with a lid and place into the freezer until completely firm, about 4 hours. 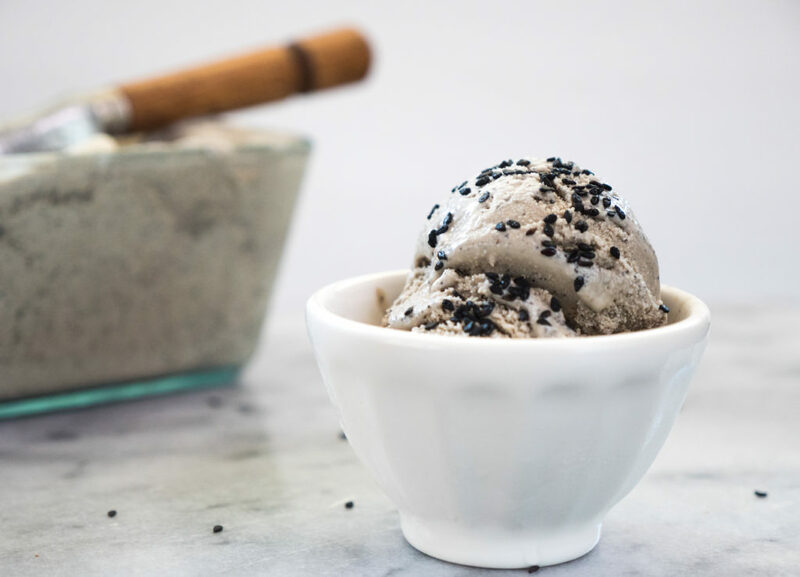 Scoop and serve with a light sprinkling of whole black sesame seeds.